My thoughts on the debut album from Wakita Monari. Honestly, at this point I’m pretty much running out of new and creative ways to introduce reviews about Wakita Monari’s music. There’s really only so many different ways to say that she’s my favorite active soloist right now or that she’s had what as best I can tell is the best what? 8 months since her solo debut that I’ve ever personally witnessed. How many more 5 star reviews (please don’t place any value in my ratings) do I have to hand out here before I’ve beaten this horse to death? I’m not really sure where I’m going with this line of thought so let’s move on. Like I said, Wakita Monari’s solo career hasn’t even been a thing for a full year yet but she’s consistently put out some of the best music I’ve heard in that time. I might have said this before, but I don’t really care to get into the debate of if she’s still an Idol or not. I kinda personally don’t think she is and she doesn’t really seem to be marketed that way, but I know people can get a little touchy when it comes to that kind of talk. We can all hopefully agree at least that she’s a very talented artist and hopefully she’ll be sticking around for a while. 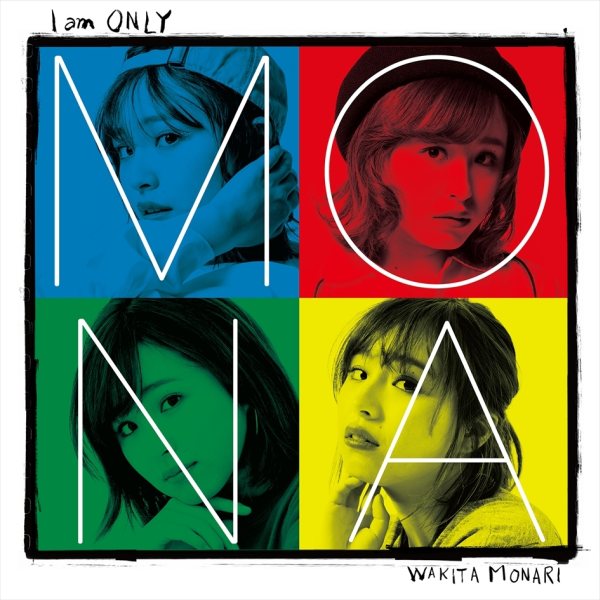 “I am ONLY” is Monari’s debut album and it’s more a collection of her first batch of singles than anything else. That’s not a bad thing, because they were all great. The only problem for me is that I’ve already reviewed them all so much of this article is going to be me retreading old ground. I’m going to focus mainly on the new songs because there are quite a few but I’ll give a brief recap of my thoughts on the older stuff and as always leave links to the full reviews so you can check those out too if you want. I’m expecting great things here so let’s see if Monari delivered or not. Rather fittingly, “I am ONLY” opens with the a-side from Monari’s debut single “IN THE CITY”. You’re going to hear this a lot, but I wrote a full review that you can read here. I really loved this single, partly because I’m down with that whole 80s Pop vibe and it also reminded me quite a bit of the sort of music Especia had been producing before they fell off a cliff latterly. If this album is your first exposure to Wakita Monari then “IN THE CITY” is a pretty good taste of what’s to come. It doesn’t take too long for the new songs to make their appearance on this album. “IRONY” does rather pick up where “IN THE CITY” left off in a lot of ways. Naturally it isn’t a carbon copy of the song that preceded it but there is a noticeable theme in play here. I guess you’d call this “City Pop” but I’m not really hip with the kids like that. The instrumental is a Jazz influenced number, sorta like Lounge music I suppose and you do kinda get the image of a smokey Jazz room in your mind while listening. Monari pushes the upper registry of her vocal range on this one and the results are kinda mixed if I’m honest. Her lower range is still on show and fantastic though. Next up is “Nakimushi Revolution” or “Crybaby Revolution” I guess? Kind of an odd title, to me at least. This song is really interesting in that it’s really the first time that Monari has really pushed the envelope on her musical stylings. There’s a very obvious change in tone on this track, it kind of sounds more like a straight up Pop number albeit a very playful sounding one. I’m in two minds if I’m honest, on the one hand this is a pretty fun song and there’s no denying that. On the other, this isn’t really what I’m here for you know? The repeated use of the “Shake your body” line just sort of put me off a bit for some reason. All the other lyrics are great though and the instrumental is some straight up summer fun. I’m probably being too hard on it honestly. We have another new song to follow on from “Nakimushi Revolution” so I might have over exaggerated the amount of old material a little. “Dippin'” is another kinda odd song title, but maybe Monari just really likes Dippin’ Dots or something. We get a pretty smooth instrumental on this one, with a sort of Lounge meets Dub thing going on. I’m probably describing it poorly but it’s really good stuff going on here. On the vocal side of things, Monari is in her element and it shows. Everything sounds so effortless, we even get a bit of soft Rapping for good measure. This might actually be one of the best songs I’ve heard from her so far. Go out of your way to hear this one folks. The run of new material continues with “Cloudless Night”, which opens with a really familiar and also rather simple sounding instrumental that’s comprised of only a drum beat and some thick bass lines. Things get spiced up a bit with some synthesizers and such as the song gets going but that simplistic formula is present throughout. This one plays very much like a ballad, until the chorus at least where things do pick up a bit. There’s a lot of English on show in this one, not that this is a new development or anything. I’m running out of ways to say “amazing vocal performance” at this point, but that’s what you get on this song. Loving that instrumental too, so smooth. “Inori no Kotoba” translates pretty much to “Words of Prayer”, but this song isn’t breaking out the gospel choirs or anything quite like that. Now I know I said “Cloudless Night” played very much like a ballad but it’s nothing compared to this song. This is pretty much the dictionary definition of a J-Pop ballad folks. It even has the sparkle sound effect in the instrumental and everything! Pretty much every J-Pop album as an unwritten rule has to have a song like this so I’m not surprised to see it included here. This style of song isn’t my cup of tea as you all know by now but there’s nothing bad about it from an objective standpoint. We break that nice little run of new material and return to a previously released song for the next track. “Boy Friend” was Monari’s second single and you can check out my full review here. Remember guys, she’s talking about a friend that’s a boy and not a boyfriend, that space is important! Joking aside, I said in my review that I knew I was going to love this song after the first 10 seconds so that’s pretty high praise coming from me. Sure it might be a bit similar to other songs Monari has done but she could do another 50 songs like this and you wouldn’t hear any complaints from me. “I’m with you” is up next. This song was the a-side from Monari’s most recent single and once again you can check out my full review by clicking here. Again, no this is not a cover of the Avril Lavigne song thankfully/unfortunately (delete as appropriate). This one does kinda have a more of the same feel to it but the producers have worked a few new elements into the instrumental to freshen things up a bit. It’s a pretty relaxed song on the whole, which I think benefits Monari’s vocals greatly as she does sometimes sound like she’s struggling to get power behind her high notes. That’s definitely not an issue here though. I still have zero clue what “EST! EST!! EST!! !” is supposed to mean as a song title and none of you ever did tell me if it was a reference to something either. The song was the b-side on Monari’s last single “I’m with you” which you can of course read my full thoughts on here. Once again we had a bit of a ballad on our hands, but this one has a pretty awesome Jazz influenced instrumental so I can get down with that. I say this quite a bit but I don’t think I’ve said it in this review yet. Pretty much every b-side that Wakita Monari has done so far could quite easily be the a-side on their own single. It’s quite incredible honestly. We go three in a row on previously released material with “Akai Skirt” up next in the running order. I shouldn’t really have to translate that title for most of you, but it means “Red Skirt”. This was the b-side from the “Boy Friend” single and you can read my thoughts, blah, blah, blah, here, etc. This one was a little bit more out there by Monari’s usual standards, with some kinda weird synthesizer stuff going on. It certainly made a song that would otherwise be yet another ballad a bit more interesting though so I don’t hate it. Not that high up on my list of favorite Monari songs but considering the competition I think that’s okay. “Ano ne…” is the album’s penultimate song and once again we’re dipping into the previously released material. This time we have the b-side from “IN THE CITY” and in case you didn’t know, you can read my full review of it here. See, I wasn’t lying when I said you’d be getting a lot of brief re-caps. Anyway, I guess you could consider this a “middle of the road” Wakita Monari song when you hold it up to her output since it first came out. Middle of the road for Monari is still better than some artists’ best though so don’t take that as me knocking this song. That would be very silly of me. The album closes with a new song, breaking that fairly lengthy run of older material we had there. Here we have “Yoake no View” or “Dawn’s View” I suppose, if English is more your thing. We’re definitely ending things on a high note folks, with another incredible vocal performance…man I’m sounding like a broken record but I can’t help it. I’ll never get tired of these 80s style Jazz tinged instrumentals either so feel free to keep those coming too. If I haven’t sold you on this album by now then I’m not sure what it’s going to take in all honesty. Well then, that was quite the album there. Probably going to be up there on any list I decide to do for the end of the year so spoiler alert on that one I guess. I’m not totally sure I would have split the album into old and new material quite as cleanly as they did here but that’s a minor thing. All the songs are at the very least good, with many of them being fantastic in my view. So they should be too with all of the guest composers and producers they got in to work on them. In case you can’t tell, I’m all aboard the Wakita Monari hype train. She hasn’t had a song I don’t like yet, which is pretty amazing considering how picky I tend to be. How much longer can she keep it up? I’m not sure but I’m sure as hell going to along for the ride that’s for sure. I just need to see about seeing her live in November now.